Dell Technologies, one of the leading computing brands of the world, is known for its great technology as well as superior quality. In the past few years, several major changes have happened at Dell. Apart from the acquisition of EMC, Dell is ready to go public again. Acquisition of EMC has helped Dell expand its range of products and services. However, the computing industry is still full of challenges and intense competition. Apart from being innovative, Dell is also highly competitive and spends a fortune each year on research and innovation. The computing industry is highly aggressive in terms of growth and each brand is investing heavily to grow its customer base. In such a scenario, apart from product quality, it is marketing that helps a brand attract and retain customers. 21st century marketing is using various new channels and mostly digital. These channels provide huge reach, bring down costs massively and are highly effective. Social media is the favourite of marketers because you can connect with millions without paying a dime. Most technology brands have maintained an active social media presence to stay connected with their fans and followers. However, apart from marketing and running seasonal campaigns brands are using social media to communicate with followers and engage customers to address customer service related issues. Dell has also maintained an active presence on the social media networks. Social media is the most convenient channel when it comes to addressing large group of followers at once and informing them of new products and services. However, a lot of care is also required while running social media marketing campaigns. Errors on the social media can be costly and very few brands have a perfect social media strategy. In this post, you will check how Dell is using social media to connect with its fans and customers – a look at the strong and weak points of Dell’s social media strategy and its results on each of the major networks. The number one social media network is also the marketers’ favourite when it comes to promoting your content using social media channels. Facebook boasts of more than 2 Billion active users. Any technology company will hardly find such a large pool of customers on any other platform. Moreover, the next-gen customers were born with technology and if you want to connect with them, Facebook is likely the most suitable channel. The millennials are also the largest customer group for technology products. Dell has maintained several accounts on Facebook. Its largest account on Facebook is the Dell India account which it uses mainly for running marketing campaigns. It looks like it does not use its main account actively for customer service or communications as several other brands do to engage their customers. Well, some brands are highly interactive on Facebook and their managers reply to queries actively. Dell is relatively mute and apart from posting new products and advertising campaigns, does not try to deeply engage its customers using active discussions. The number of likes on each of its posts, which generally hangs around 100, signifies shallow engagement. However, this is not rare in case of computing brands. Take the example of Apple and you will find, it hardly even cares what’s going on inside its Facebook account. So, neither Dell social media managers and nor the followers are to be blamed. However, the number of followers is still high at 12 millions. This is what makes Facebook really attractive in terms of marketing. These posts still receive thousands of views and can be good to bring attention of the audience towards new products. Dell’s social media strategy for Facebook is not aggressive. Apart from a few posts daily (not more than 2 to 3), Dell does not have any serious Facebook strategy. The posts generally include promotions, events and other types of campaigns. Facebook is a platform for sharing and conversations. However, Dell is using its sharing functionality well but not the conversations functionality. Otherwise, there are several businesses which utilise these functionalities efficiently to measure user satisfaction and gather fresh insights so as to make their social media marketing more effective. Seen in this light, Dell may not be using Facebook to its full potential. Twitter is also an attractive social media network which despite having a smaller active user base than Facebook is considered effective in terms of marketing. There are several brands that play more actively on twitter than Facebook. The reason is its effectiveness in terms of real time marketing. The Twitter experience differs form Facebook in several aspects. Apart from Dell’s official account, Michael Dell himself is also active on Twitter and actively engages with his followers through regular tweets. Just as in case of Facebook, on Twitter too, Dell is not highly aggressive. It uses Twitter also mainly for promotions. However, the main official Twitter handle of Dell looks more alive than its Facebook account. Dell uses its Twitter account to engage its more than 700k followers through regular promotions and marketing campaigns. From seasonal promotions of products to events and news on Dell university as well as research and innovation, Dell engages its followers on all these topics and in several more areas related to technology. The purpose is not just to promote its products and ideas but also to engage users by educating them. However, Michael Dell’s Twitter account is more popular and the leader engages his followers through regular tweets related to technological ideas and education. He tweets regularly to keep his audience motivated and engaged. The high number of retweets and likes signifies both popularity and credibility. 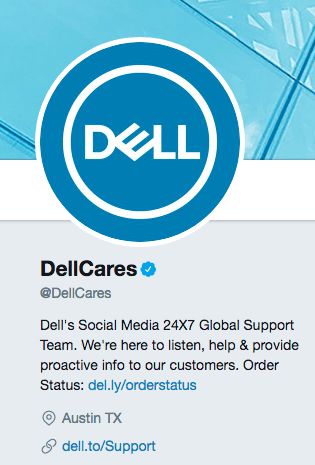 Dell is using social media to provide customer service and solutions to general problems through its Dell cares Twitter account. This Twitter handle of Dell has more than 85 followers. Apart from offering solutions to common updates, the brand also offers information on updates as well as to keep its user posted. Dell user can find troubleshooting guides and other self help topics on Dell cares Twitter account. However, Dell has a dedicated support page on its website open to its users 24/7 for products, devices and customer service related issues. Instagram is also a popular social media stop with a very large number of active users. A large number of brands use it for promotions and to connect with users. Dell’s number of followers on Instagram is nearly the same as that on Twitter. It has more than 650 K followers on Instagram too and has made around 800 posts. Instagram is the favourite stop of social media marketers for electronics, consumer electronics and fashion brands. while it is the social network for multimedia sharing and mainly images and videos, it has several attractive features that make it highly suitable for marketing and promotions. Dell has posted around 800 such multimedia file on Instagram. Its managers interact with followers wishing them well and encourage some communication between the brand and its followers. the level of interaction between the company and the customers is slightly higher on this network. However, Dell uses mainly its website and the Dell Cares handle on twitter for customer service. Instagram account of Dell is mainly for promotions of its products and technologies. However, Instagram offers some features that can drive engagement level high. Dell is doing somewhat better on Instagram in terms of overall user engagement. YouTube is the social media network for video sharing. Basically, it is about sharing videos with its followers and not feedback or customer service. There are some basic features that can make feedback and conversation possible. YouTube is for sharing. The conversation functionality is not there on this platform. However, brands can still utilise its video sharing functionality to maximise the impact of their marketing strategy by promoting video content. Video marketing is now an essential part of every brand’s marketing strategy. Dell has around 135K subscribers on YouTube following its channel. It also has an Alienware account on YouTube which has more than 151K followers. Its Alienware account has higher engagement level and has attracts more views on each video which shows high popularity of the Alienware laptops. However, apart from promotional videos, Dell also posts educational videos to engage its users related to hottest topics in computing technology. Brands should not use video content just for promotions but usually it is good to engage the users on a wide range of topics. Linked In is also a major social media channel where brands can engage a large audience of professionals. people do not use it just for a job hunt but to connect with other professionals and their favourite brands too. Dell has its second largest group of fans and followers on Linked. There are more than 1.9 million followers of Dell on Linked In. Dell’s user engagement level on this social media network is also strong. Apart from sharing and connecting, Linked In provides, conversation functionality too. Users and followers can comment on your posts as well as share them in their own accounts. Brands can use this platform to showcase their culture and work environment and to attract best talent. In this area Linked In is also good for branding. Dell uses its account to actively promote its work culture by showcasing the events that are a regular part of its work environment. It notifies its followers of hirings through its account and also to keep them posted about the so many exciting things going on inside Dell at a regular basis. Like twitter, it uses multiple handles on Linked In too. however, it uses mostly he main account to connect with its audience. Social media has become the main playground of marketers. the social media platforms are getting to witness the gathering of a large number of brands seeking to actively connect with their audience and promote their content. Apart form multimedia images and videos, businesses use these platforms to start conversations and to gather fresh insights by monitoring user feedback and responses for effective marketing. Dell has used these platforms mainly for promotions and connection. However, on some of the platforms and particularly, Twitter, Linked In and Instagram it is more active. In terms of marketing and promotions, it is not highly aggressive. It is good to use social media carefully because its aggressive use can sometimes spoil the user experience and leave a bad taste. Overall, Dell is doing well in this area and could use some of these channels for more effective conversations and user engagement.